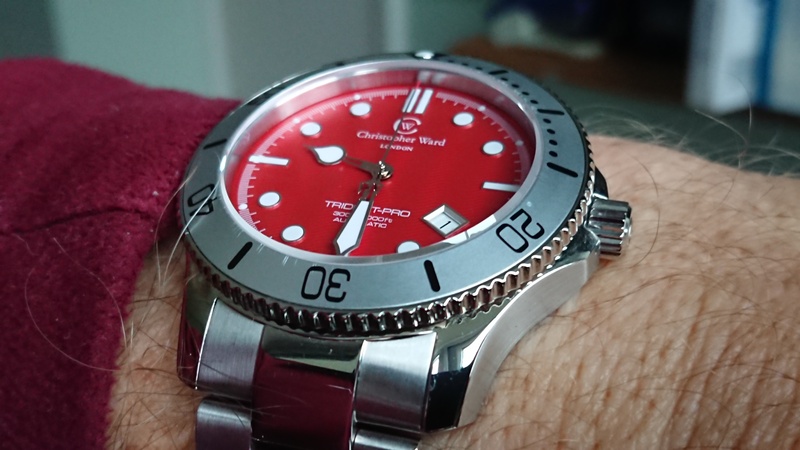 I have recently bought a MKII GMT Red Bezel White Dial 38mm and I read on here that is a rare colour combination. How rare are they actually and are there any other rare (or rarer) colour and size combinations of the trident about that I'm not aware of? The Green bezel with white face seems to be quite rare, Took me quite a while to replace when I stupidly sold the 1st one I had! I would have to say the Blue bezel/White face is the hardest to come by. Ebel Chrnon,Stein NavB DLC,Hanhart Minos,Nomos Metro,NomosAhoi ATL,Panerai 351,Omega Spdmstr Mk2,Halios Tropic B,,JLC Master Comp Chrono, Tudor GMT. I've had a couple that I do miss, the red bezel/white dial as well as the blue bezel/white dial. Both were 43mm Mk2 non GMT Trident Pros (with the ceramic bezel). I agree the green bezel, white face is also quite rare. The 2012 FLEs being the scooter blue and The Red Jag are as rare as they get at 50 apiece. scooter wrote: The 2012 FLEs being the scooter blue and The Red Jag are as rare as they get at 50 apiece. That exact watch went up for sale on the facebook page yesterday morning by a frequent contributor that I've personally sold to in the past. US based however. $700 USD + freight. Only 2 problems with that.....I don't use Facebook and unlikely to buy from USA due to additional postage costs. It was a tongue-in-cheek post of course mainly 'cos I don't understand why there would be 300 views of a WTB post if there isn't 300 people that have 1 they're considering selling.